This article is about the city in Alberta, Canada. For other uses, see Lethbridge (disambiguation). Ad occasionis januam "Gateway to Opportunity"
Lethbridge /ˈlɛθbrɪdʒ/ is a city in the province of Alberta, Canada, and the largest city in southern Alberta. It is Alberta's fourth-largest city by population after Calgary, Edmonton and Red Deer, and the third-largest by land area after Calgary and Edmonton. The nearby Canadian Rockies contribute to the city's warm summers, mild winters, and windy climate. Lethbridge lies southeast of Calgary on the Oldman River. Before the 19th century, the Lethbridge area was populated by several First Nations at various times. The Blackfoot referred to the area as Aksaysim ("steep banks"), Mek-kio-towaghs ("painted rock"), Assini-etomochi ("where we slaughtered the Cree") and Sik-ooh-kotok ("coal"). The Sarcee referred to it as Chadish-kashi ("black/rocks"), the Cree as Kuskusukisay-guni ("black/rocks"), and the Nakoda (Stoney) as Ipubin-saba-akabin ("digging coal"). The Kutenai people referred to it as ʔa•kwum. After the US Army stopped alcohol trading with the Blackfeet Nation in Montana in 1869, traders John J. Healy and Alfred B. Hamilton started a whiskey trading post at Fort Hamilton, near the future site of Lethbridge. The post's nickname became Fort Whoop-Up. The whiskey trade led to the Cypress Hills Massacre of many native Assiniboine in 1873. The North-West Mounted Police, sent to stop the trade and establish order, arrived at Fort Whoop-Up on 9 October 1874. They managed the post for the next 12 years. Lethbridge's economy developed from drift mines opened by Nicholas Sheran in 1874 and the North Western Coal and Navigation Company in 1882. North Western's president was William Lethbridge, from whom the city derives its name. By the turn of the century, the mines employed about 150 men and producing 300 tonnes of coal each day. In 1896, local collieries were the largest coal producers in the Northwest Territories, with production peaking during World War I. An internment camp was set up at the Exhibition Building in Lethbridge from September 1914 to November 1916. After the war, increasing oil and natural gas production gradually replaced coal production, and the last mine in Lethbridge closed in 1957. The first rail line in Lethbridge was opened on August 28, 1885 by the Alberta Railway and Coal Company, which bought the North Western Coal and Navigation Company five years later. The rail industry's dependence on coal and the Canadian Pacific Railway's efforts to settle southern Alberta with immigrants boosted Lethbridge's economy. After the Canadian Pacific Railway (CPR) moved the divisional point of its Crowsnest Line from Fort Macleod to Lethbridge in 1905, the city became the regional centre for Southern Alberta. In the mid-1980s, the CPR moved its rail yards in downtown Lethbridge to nearby Kipp, and Lethbridge ceased being a rail hub. Between 1907 and 1913, a development boom occurred in Lethbridge, making it the main marketing, distribution and service centre in southern Alberta. Such municipal projects as a water treatment plant, a power plant, a streetcar system, and exhibition buildings—as well as a construction boom and rising real estate prices—transformed the mining town into a significant city. 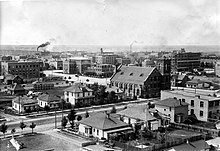 Between World War I and World War II, however, the city experienced an economic slump. Development slowed, drought drove farmers from their farms, and coal mining rapidly declined from its peak. After World War II, irrigation of farmland near Lethbridge led to growth in the city's population and economy. Lethbridge College (previously Lethbridge Community College) opened in April 1957 and the University of Lethbridge in 1967. The city of Lethbridge is located at 49.7° north latitude and 112.833° west longitude and covers an area of 127.19 square kilometres (49.11 sq mi). The city is divided by the Oldman River; its valley has been turned into one of the largest urban park systems in North America at 16 square kilometres (4,000 acres) of protected land. The city is Alberta's fourth largest by population after Calgary, Edmonton, and Red Deer. It is the third largest in area after Calgary and Edmonton and is near the Canadian Rockies, 210 kilometres (130 mi) southeast of Calgary. Lethbridge is split into three geographical areas: north, south and west. The Oldman River separates West Lethbridge from the other two while Crowsnest Trail and the Canadian Pacific Railway rail line separate North and South Lethbridge. The newest of the three areas, West Lethbridge (pop. 36,716) is home to the University of Lethbridge, opened at that site in 1971, but the first housing was not completed until 1974 and the prime Whoop-Up Drive access opened only in 1975. Much of the city's recent growth has been on the west side, and it has the youngest median age of the three. The north side (pop. 26,751) was originally populated by workers from local coal mines. It has the oldest population of the three areas, is home to multiple industrial parks and includes the former Hamlet of Hardieville, which was annexed by Lethbridge in 1978. South Lethbridge (pop. 31,337) is the commercial heart of the city. It contains the downtown core, the bulk of retail and hospitality establishments, and the Lethbridge College. Lethbridge has a semi-arid climate (Köppen climate classification BSk) with an average maximum temperature of 12.3 °C (54.1 °F) and an average minimum temperature of −1.1 °C (30.0 °F). With precipitation averaging 365 mm (14.4 in)–386.3 mm (15.2 in), and 264 dry days on average, Lethbridge is the eleventh driest city in Canada. Mean relative humidity hovers between 69–78% in the morning throughout the year, but afternoon mean relative humidity is more uneven, ranging from 38% in August to 58% in January. On average, Lethbridge has 116 days with wind speed of 40 km/h (24.9 mph) or higher, ranking it as the second city in Canada for such weather. Its high elevation of 929 m (3,047.9 ft) and close proximity to the Rocky Mountains provides Lethbridge with cooler summers than other locations in the Canadian Prairies. These factors protect the city from strong northwest and southwest winds and contribute to frequent chinook winds during the winter. Lethbridge winters have the highest temperatures in the prairies, reducing the severity and duration of winter cold periods and resulting in fewer days with snow cover. The average daytime temperature peaks by the end of July/beginning of August, when it reaches 26.4 °C (79.5 °F). The city's temperature reaches a maximum high of 35 °C (95 °F) or greater on average once or twice a year. The highest temperature ever recorded in Lethbridge was 40.5 °C (105 °F) on August 10, 2018. The lowest temperature ever recorded was −42.8 °C (−45 °F) on January 7, 1909, December 18, 1924, January 3, 1950, and December 29, 1968. Lethbridge seen from Halmrast Manor. The population of the City of according to its 2017 municipal census is 98,198, a change of 1.4% from its 2016 municipal census population of 96,828. In the 2016 Census of Population conducted by Statistics Canada, the City of Lethbridge recorded a population of 92,729 living in 37,575 of its 39,867 total private dwellings, a change of 11% from its 2011 population of 83,517. With a land area of 122.09��km2 (47.14 sq mi), it had a population density of 759.513759.5/km2 (1,967.1311,967.1/sq mi) in 2016. The same census reported that the metropolitan area of Lethbridge was 117,394 in 2016, up from 105,999 in 2011. In the 2011 federal census, the City of Lethbridge had a population of 83,517 living in 34,140 of its 37,396 total dwellings, a change of 11.8% from its 2006 adjusted population of 74,685. With a land area of 122.36 km2 (47.24 sq mi), it had a population density of 682.551682.6/km2 (1,767.8001,767.8/sq mi) in 2011. In 2006, Lethbridge had a predominantly white population; one out of eight people were non-European, compared to one in ten in 2001. Of those, 40 percent were aboriginal, most of whom came from the nearby Peigan and Kainai nations. Of the remaining 60 percent, Japanese, Chinese and Latin American made up the largest portion at over 1,200, 920 and 705 respectively. The most commonly observed faith in Lethbridge is Christianity. According to the 2011 National Household Survey, 52,595 residents, representing 65 percent of respondents, indicated they were Christian, down from 76% in 2001. Over 32 percent of Lethbridgians reported no religious affiliation, a substantial increase from 22% in 2001. The number of residents reporting other religions, including Buddhists, Muslims, Hindus, Jews and Sikhs amounted to 3 percent. For specific denominations, Statistics Canada reported 16,945 Roman Catholics who were 21 percent of the population, and 7,335 members of the United Church of Canada who were about 9 percent of the population. According to the 2011 census, more than 87 percent of residents spoke English as a first language. Nearly 2 percent spoke German; just over 1 percent each spoke Spanish, Dutch, or French; and almost 1 percent each spoke Chinese (unspecified), Tagalog, Polish, or Hungarian their first language. The next most commonly spoken languages were Japanese, Italian, Ukrainian, Nepali, Cantonese, Vietnamese. Lethbridge is southern Alberta's commercial, distribution, financial and industrial centre (although Medicine Hat plays a similar role in southeastern Alberta). It has a trading area population of 341,180, including parts of British Columbia, and provides jobs for up to 86,000 people who commute to and within the city from a radius of 100 kilometres (62 mi). Lethbridge serves as a hub for commercial activity in the region by providing services and amenities. Many transport services, including Greyhound buses, four provincial highways, rail service and an airport, are concentrated in or near the city. In 2004, the police services of Lethbridge and Coaldale combined to form the Lethbridge Police Service. Lethbridge provides municipal water to Coaldale, Coalhurst, Diamond City, Iron Springs, Monarch, Shaughnessy and Turin. In 2002, the municipal government organized Economic Development Lethbridge, a body responsible for promoting and developing the city's commercial interests. Two years later, the city joined in a partnership with 24 other local communities to create an economic development alliance called SouthGrow, representing a population of over 140,000. In 2006, Economic Development Lethbridge partnered with SouthGrow Regional Initiative and Alberta SouthWest Regional Alliance to create the Southern Alberta Alternative Energy Partnership. This partnership promotes business related to alternative energy, including wind power, solar power and biofuel, in the region. The city is home to venues and organizations promoting the arts. Founded in 1958, the Allied Arts Council of Lethbridge is the largest organization in the city dedicated to preserving and enhancing the local arts. In the spring of 2007, the Allied Arts Council Facilities Steering Committee initiated the Arts Re:Building Together Campaign, a grass roots campaign initiative to raise awareness and support for improving arts facilities in Lethbridge. The campaign identified three arts buildings: the Yates Memorial Centre, the Bowman Arts Centre, and the Southern Alberta Art Gallery as cornerstone facilities in the community requiring care and attention. On July 14, 2007, the Finance Committee of City Council approved four arts capital projects for inclusion in the City's Ten Year Capital Plan. Under the campaign to 2010, the renovation and expansion of the Southern Alberta Art Gallery was completed, a new Community Arts Centre will be built in downtown Lethbridge, the City of Lethbridge has a Public Art Program, and a committee was formed to research the possibility of a new Performing Arts Centre in Lethbridge. Lethbridge has a public library and three major museum/galleries. The Southern Alberta Art Gallery is a contemporary gallery; the community arts centre Casa, administered by the Allied Arts Council; and the University of Lethbridge Art Gallery produces contemporary exhibitions including works from its extensive collection of Canadian, American and European art. The city is also home to the Lethbridge Symphony, which was founded in 1960 and incorporated as a non-profit in 1961. It has produced several spin-off music groups, including the Southern Alberta Chamber Orchestra, and the still-active Lethbridge Musical Theatre, which produces an annual show. Vox Musica, which traces its roots back to 1968, is a community choir previously based at the University of Lethbridge. As a fully independent non-profit society, Vox Musica continues to rehearse and perform at Southminster United Church and around the community. Theatrical productions are presented by the University of Lethbridge's drama department and New West Theatre, which performs at the Genevieve E. Yates Memorial Centre using its two theatres: the 500-seat proscenium Yates Theatre and the 180-seat black box Sterndale Bennett Theatre. The city, which began as a frontier town, has several historical attractions. The Lethbridge Viaduct, commonly known as the High Level Bridge, is the longest and highest steel trestle bridge in North America. It was completed in 1909 on what was then the city's western edge. Indian Battle Park, in the coulees of the Oldman River, commemorates the last battle between the Cree and the Blackfoot First Nations in 1870. Originally known as Fort Hamilton, Fort Whoop-Up was a centre of illegal activities during the late 19th century. It was first built in 1869 by J.J. Healy and A.B. Hamilton as a whiskey post and was destroyed by fire a year later. A second, sturdier structure later replaced the fort. Several structures such as the historic post office are prominent on the skyline of Lethbridge. Less well-known than the High Level Bridge, the post office is one of the most distinctive buildings in Lethbridge. Built in 1912, the four-storey structure is crowned by a functioning clock tower. Other prominent buildings include office towers; the water tower, which was originally built in 1958 and sold to a private developer who converted it into a restaurant; and the Alberta Terminals grain elevators. Lethbridge has designated 16 percent of the land within city boundaries as parkland, including the 755 hectares (1,870 acres) Oldman River valley parks system. It has facilities for field sports, numerous baseball diamonds, the Spitz Stadium baseball stadium, a disc golf course, 2 skate parks, a BMX track, a climbing wall, a dozen tennis courts, and seven pools. It is home to five golf courses, including the award-winning Paradise Canyon Golf Resort, and is within 30 kilometres (19 mi) of several others. Built for the 1975 Canada Games, the ENMAX Centre is Lethbridge's multipurpose arena. The 6,500-seat facility has hosted concerts, three-ring circuses, multicultural events, national curling championships, basketball events, banquets, skating events and is home to the Lethbridge Hurricanes, a major Western Hockey League franchise. The arena has a running track, racquetball and squash courts, and a full-size ice rink. In 1997, the 58,000-square-foot (5,400 m2) Community Savings Place (formerly the Lethbridge Soccer Centre) was built directly south of the ENMAX Centre and added two regulation size indoor soccer pitches to the complex. The Lethbridge Kyodokan Judo Club facility is located next to the Community Savings Place, and has been a Judo Canada Regional Training Centre since 2015. On the city's west side, Phase 1 of the ATB Centre, a recreation complex, opened in 2016 and houses two hockey rinks and the Lethbridge Curling Club. Phase 2 of this project will open in 2019 and will include a field house with basketball courts and a 300m running track, and an aquatics centre with slides and a wave pool. Several winter sports venues are in or near Lethbridge. The city has six indoor ice arenas with a total ice area of 11,220 square metres (120,800 sq ft) and a total seating capacity of 8,149. Other than the ENMAX Centre, all ice surfaces are available from October to April only. Lethbridge is 150 kilometres (93 mi) east of the Castle Mountain ski resort. Eight councillors and a mayor make up the Lethbridge City Council. City voters elect a new government every four years. The last election was October 16, 2017. Lethbridge does not have a ward system, so the mayor and all councillors are elected at large. The 2009–2011 operating budget of the City of Lethbridge was C$250–278 million, more than half of which came from property tax. One Member of Parliament (MP) representing Lethbridge sits in the House of Commons in Ottawa, and two members of Alberta's legislative assembly (MLAs), representing Lethbridge-East (NDP) and Lethbridge-West (NDP), sit in the legislative assembly in Edmonton. Traditionally, political leanings in Lethbridge have been right-wing. Federally, from 1917 to 1930, Lethbridge voters switched between various federal parties, but from 1935 to 1957, they voted Social Credit in each election. Progressive Conservatives held office from 1958 until 1993, when the Reform Party of Canada was formed. The Reform party and its various subsequent incarnations such as the current Conservative Party of Canada have dominated the polls since. In contrast, the city's two provincial electoral districts are both represented by the centre-left Alberta New Democratic Party. The Alberta government through Alberta Health Services administers public health services. Chinook Health oversees facilities in southwestern Alberta, such as the Chinook Regional Hospital and St. Michael's Health Centre. Mass transit in Lethbridge consists of 40 buses (with an average age of 10 years) operating on more than a dozen routes. Traditionally, bus routes in the city started and ended downtown. In the early 21st century, however, Lethbridge Transit introduced cross-town and shuttle routes, such as University of Lethbridge to Lethbridge College, University of Lethbridge to the North Lethbridge terminal, and Lethbridge College to the North Lethbridge terminal. Several routes converge near the Chinook Regional Hospital, although it is not officially a terminal. The Parks and Recreation department maintains the citywide, 30-kilometre (19 mi) pedestrian/cyclist Coal Banks Trail system (map). 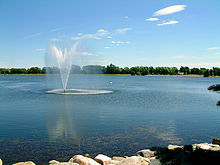 The system was designed to connect the Oldman River valley with other areas of the city, including Pavan Park in the north, Henderson Lake in the east, Highways 4 and 5 in the south and a loop in West Lethbridge (including University Drive and McMaster Blvd). Four provincial highways (3, 4, 5, and 25) run through or terminate in Lethbridge. This has led to the creation of major arterial roads, including Mayor Magrath Drive, University Drive and Scenic Drive. This infrastructure and its location on the CANAMEX Corridor has helped make Lethbridge and its freight depots a major shipping destination. Lethbridge is 100 kilometres (62 mi) north of the United States border via Highways 4 and 5 and 210 kilometres (130 mi) south of Calgary via Highways 2 and 3. Highways 2, 3 and 4 form part of the CANAMEX trade route between Mexico, the United States, and Canada. Lethbridge has a commercial airport, the Lethbridge Airport, and the CPR rail yards in Kipp, Alberta (12 km away). The airport provides commercial flights to Calgary, industrial and corporate opportunities, as well as private and charter flights elsewhere. The airport provides customs services for flights arriving from the United States. The rail yards were moved to Kipp, just west of the city, from downtown Lethbridge in 1983. The yards were planned for redevelopment with a mix of multi-family residential, commercial and light industrial land uses. The Park Place Mall is now located on the portion of the former rail yards north of 1 Avenue South between Scenic Drive to the west and Stafford Drive to the east. Galbraith School building ca. 1920s, North Lethbridge. The Lethbridge School District No. 51 and the separate Holy Spirit Roman Catholic School Division administer grades kindergarten through 12 locally. The Palliser School Division, which is based in Lethbridge, administers public primary and secondary education in the outlying areas. Lethbridge School District No. 51 administers four high schools (Chinook High School, Lethbridge Collegiate Institute, Winston Churchill High School and Immanuel Christian High School), four middle schools, and 12 elementary schools in Lethbridge. Lethbridge is home to Lethbridge College, founded in 1957, and the University of Lethbridge, founded in 1967. Red Crow Community College has a campus in the city. During the 2003–2004 school year, the University of Lethbridge and the Lethbridge College had a combined enrolment of 14,000, which was 20 percent of the city's population. Lethbridge has two major newspapers: the daily Lethbridge Herald and the weekly Lethbridge Sun Times. The university and college each have a student-run, weekly newspaper. There are 11 FM radio stations, including CKXU-FM, a campus radio station located at the University of Lethbridge. ^ City of The Lethbridge. "City of Lethbridge Crest/Coat of Arms". Retrieved June 12, 2014. 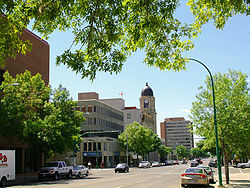 ^ "Location and History Profile: City of Lethbridge" (PDF). Alberta Municipal Affairs. June 17, 2016. p. 78. Retrieved June 18, 2016. ^ a b c d "Population and dwelling counts, for Canada, provinces and territories, and census subdivisions (municipalities), 2016 and 2011 censuses—100% data (Alberta)". Statistics Canada. February 8, 2017. Retrieved February 8, 2017. ^ a b "Population and dwelling counts, for census metropolitan areas, 2016 and 2011 censuses—100% data". Statistics Canada. February 8, 2017. Retrieved February 8, 2017. ^ a b "Population and dwelling counts, for Canada, provinces and territories, and population centres, 2016 and 2011 censuses—100% data (Alberta)". Statistics Canada. February 8, 2017. Retrieved February 8, 2017. ^ a b c d e f g h i j k l Greg Ellis (October 2001). "A Short History of Lethbridge, Alberta". Archived from the original on September 23, 2005. Retrieved January 17, 2007. ^ "FirstVoices: Nature / Environment—place names: words. Ktunaxa". Retrieved July 7, 2012. ^ "Indian Battle Park". City of Lethbridge. Archived from the original on August 28, 2004. Retrieved February 16, 2007. ^ "Alphabetical list of Private Acts—Railways". Table of Private Acts (1867 to December 31, 2013), Railways. Department of Justice Canada. November 27, 2014. Archived from the original on December 23, 2014. Retrieved November 30, 2014. ^ "Executive Summary" (PDF). Highways 3 & 4, Lethbridge and Area NHS & NSTC, Functional Planning Study, #R - 970. Stantec Consulting Ltd. February 2006. Archived from the original (PDF) on June 21, 2007. Retrieved February 16, 2007. ^ "Field Guide Booklet" (PDF). The Lethbridge Naturalists Society. Archived from the original (PDF) on March 6, 2016. Retrieved January 21, 2010. ^ Ellis, Faron (November 2004). "Alberta Provincial Election Study" (PDF). Citizen-Society Research Lab. Archived from the original (PDF) on February 29, 2008. Retrieved February 16, 2007. ^ a b c "2015 Census Results". City of Lethbridge. June 18, 2015. Archived from the original on June 20, 2015. Retrieved June 20, 2015. ^ Ian MacLachlan (March 11, 2005). "Whiskey Traders, Coal Miners, Cattle Ranchers and a Few Bordellos". Archived from the original on September 27, 2011. Retrieved July 25, 2011. ^ The Local Authorities Board (December 23, 1977). "Order No. 10079" (PDF). Retrieved May 31, 2010. ^ "Hardieville/Legacy Ridge/Uplands Area Structure Plan" (PDF). UMA Engineering Ltd. Retrieved August 14, 2007. ^ "Lethbridge CDA, Alberta". Canadian Climate Normals 1971–2000. Environment Canada. February 4, 2013. Archived from the original on November 20, 2012. Retrieved April 18, 2013. ^ a b c d "Lethbridge A, Alberta". Canadian Climate Normals 1981–2010. Environment Canada. Retrieved May 12, 2014. ^ a b c Lethbridge Trade Area and Commercial Catchment Study Archived November 29, 2016, at the Wayback Machine, Economic Development Lethbridge. 2016. Retrieved November 28, 2016. ^ a b c Community Profile, Lethbridge Chamber of Commerce. Retrieved December 24, 2006. ^ "Climate Data Almanac for August 02". Environment Canada. Archived from the original on June 28, 2013. Retrieved June 25, 2013. ^ "Daily Data Report for August, 2018". Environment Canada. Retrieved August 12, 2018. ^ a b "Lethbridge CDA". Canadian Climate Normals 1971–2000. Environment Canada. Retrieved May 15, 2016. ^ "Lethbridge". Canadian Climate Data. Environment Canada. Retrieved May 15, 2016. ^ "Lethbridge A, Alberta". Canadian Climate Normals 1981–2010. Environment Canada. Retrieved October 3, 2013. ^ "April 1910". Canadian Climate Data. Environment Canada. Retrieved May 15, 2016. ^ "January 2015". Canadian Climate Data. Environment Canada. Retrieved May 15, 2016. ^ "Table 6: Population by census subdivisions, 1901–1961". 1961 Census of Canada. Series 1.1: Historical, 1901���1961. Volume I: Population. Ottawa: Dominion Bureau of Statistics. 1963. p. 6.77-6.83. ^ "Table 2: Census Divisions and Subdivisions—Population and Occupied Private Dwellings, 1981 and 1986". Census Canada 1986. Population and Dwelling Counts—Provinces and Territories (Alberta). Ottawa: Statistics Canada. 1987. p. 2.1–2.10. ISBN 0-660-53463-0. ^ "Table 2: Population and Dwelling Counts, for Census Divisions and Census Subdivisions, 1986 and 1991—100% Data". 91 Census. Population and Dwelling Counts—Census Divisions and Census Subdivisions. Ottawa: Statistics Canada. 1992. pp. 100–108. ISBN 0-660-57115-3. ^ "Table 10: Population and Dwelling Counts, for Census Divisions, Census Subdivisions (Municipalities) and Designated Places, 1991 and 1996 Censuses—100% Data". 96 Census. A National Overview—Population and Dwelling Counts. Ottawa: Statistics Canada. 1997. pp. 136–146. ISBN 0-660-59283-5. ^ "Population and Dwelling Counts, for Canada, Provinces and Territories, and Census Divisions, 2001 and 1996 Censuses—100% Data (Alberta)". Statistics Canada. Retrieved April 1, 2012. ^ "Population and dwelling counts, for Canada, provinces and territories, and census subdivisions (municipalities), 2006 and 2001 censuses—100% data (Alberta)". Statistics Canada. January 6, 2010. Retrieved April 1, 2012. ^ Canada, Government of Canada, Statistics. "Census Profile, 2016 Census—Lethbridge [Census metropolitan area], Alberta and Alberta [Province]". www12.statcan.gc.ca. Retrieved March 2, 2017. ^ Lethbridge Community Profile Statistics Canada. 2007. 2006 Community Profiles. Released March 13, 2007. Last modified March 13, 2007. ^ "NHS Profile, Lethbridge, CY, Alberta, 2011", Statistics Canada, archived from the original on January 5, 2016 . ^ "Lethbridge, Alberta (Code 4802012) and Division No. 2, Alberta (Code 4802) (table)". 2011 Census. Statistics Canada. October 24, 2012. Retrieved February 28, 2013. ^ "Major employers of Lethbridge—2005". Economic Development Lethbridge. Archived from the original on August 23, 2006. Retrieved August 2, 2006. ^ Company History, Taco Time Canada. Retrieved December 24, 2006. ^ Braman Furniture International, Canadian Company Capabilities, Industry Canada. Last Updated: November 9, 2005. ^ "Pipeline Project Flows Along". Sunny South News. March 14, 2002. ^ "Monarch to tap into Lethbridge water". Lethbridge Herald. February 23, 2008. ^ About Economic Development Lethbridge. Retrieved December 24, 2006. ^ Annual Report 2006 Archived September 14, 2015, at the Wayback Machine, SouthGrow. June 21, 2006. ^ Southern Alberta Economic Development Organizations Partner to Launch Major Alternative Energy Initiative. Southern Alberta Alternative Energy Partnership news release. November 6, 2006. ^ Cultural Capitals of Canada, Canadian Heritage. Retrieved December 24, 2006. ^ a b c d "Recreation & Leisure". Choose Lethbridge. Economic Development Lethbridge. Archived from the original on September 27, 2007. Retrieved February 16, 2007. ^ "About Us". Allied Arts Council of Lethbridge. Retrieved February 16, 2007. ^ "Arts Facilities". Allied Arts Council. Archived from the original on July 27, 2012. Retrieved December 9, 2010. ^ "Southern Alberta Art Gallery". Allied Arts Council. Archived from the original on July 22, 2012. Retrieved December 9, 2010. ^ "Community Arts Centre". Allied Arts Council. Archived from the original on July 31, 2012. Retrieved 9 December 2010. ^ "Public Art". Allied Arts Council. Archived from the original on December 14, 2010. Retrieved December 9, 2010. ^ "Performing Arts Centre". Allied Arts Council. Archived from the original on December 16, 2010. Retrieved December 9, 2010. ^ Nelson, Margaret; Philip M. Wults. "Lethbridge, Alta". Encyclopedia of Music in Canada. Historica. Retrieved February 16, 2007. ^ "About Us". New West Theatre. Archived from the original on February 6, 2007. Retrieved February 16, 2007. ^ Forth Junction Project. "Alberta's largest railway bridges". Archived from the original on July 11, 2011. Retrieved April 5, 2010. ^ "High Level Bridge". City of Lethbridge. Archived from the original on May 18, 2006. Retrieved October 15, 2007. ^ "Lethbridge". Encyclopædia Britannica. Encyclopædia Britannica Online. Retrieved October 15, 2007. ^ Allen, Robert. "Fort Whoop-Up". The Canadian Encyclopedia. Archived from the original on May 18, 2006. Retrieved October 15, 2007. ^ Neugebauer, Dierk (January 2003). "Nikka Yuko—A Special Place". The Journal. Toronto Bonsai Society. Archived from the original on September 26, 2006. Retrieved October 15, 2007. ^ "Our History". Galt Museum & Archives. Archived from the original on October 10, 2007. Retrieved October 15, 2007. ^ "Buildings". City of Lethbridge. Archived from the original on February 22, 2007. Retrieved October 15, 2007. ^ "Landmarks". City of Lethbridge. Archived from the original on April 2, 2007. Retrieved October 15, 2007. ^ Stantec Consulting (March 2007). "Bikeways and Pathways Master Plan". City of Lethbridge. Archived from the original on September 27, 2007. Retrieved April 28, 2007. ^ "ENMAX Centre". City of Lethbridge. Archived from the original on February 6, 2007. Retrieved February 16, 2007. ^ "Lethbridge Soccer Centre". City of Lethbridge. Archived from the original on September 3, 2004. Retrieved February 16, 2007. ^ "Judo Canada Regional Training Centre Lethbridge". Judo Alberta. Retrieved November 14, 2018. ^ "ATB Centre". www.lethbridge.ca. Retrieved November 14, 2018. 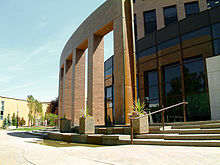 ^ "City Council". City of Lethbridge. Archived from the original on May 25, 2006. Retrieved October 15, 2007. ^ a b c "Lethbridge, Alberta (1914–1977)". History of Federal Ridings since 1867. Parliament of Canada. Retrieved October 15, 2007. ^ "Lethbridge—Foothills, Alberta (1977–1987)". History of Federal Ridings since 1867. Parliament of Canada. Retrieved October 15, 2007. ^ a b "Lethbridge, Alberta (1987 -)". History of Federal Ridings since 1867. Parliament of Canada. Retrieved October 15, 2007. ^ "Alberta NDP Wins Majority Government In Historic Provincial Election". CJOC FM. May 5, 2015. Archived from the original on May 12, 2015. Retrieved May 28, 2015. ^ Mabell, Dave (September 9, 2006). "Richard keeps the city's buses on the road". Lethbridge Herald. p. A4. ^ "Coal Banks Trail". City of Lethbridge. Archived from the original on September 7, 2004. Retrieved February 16, 2007. ^ "Information Map" (PDF). City of Lethbridge. Archived (PDF) from the original on March 3, 2016. Retrieved January 23, 2017. ^ "Rail relocation plans advanced". The Lethbridge Herald. November 6, 1981. ^ Scott, Peter (September 17, 1981). "Highway realignment plan gets favorable response". The Lethbridge Herald. p. B1. ^ "Railway Relocation Lands Area Redevelopment Plan" (PDF) (PDF). City of Lethbridge. January 1983. p. 80 (Land Use Concept). Retrieved May 30, 2014. ^ "Information Map" (PDF) (PDF). City of Lethbridge. June 2013. Retrieved May 30, 2014. Wikimedia Commons has media related to Lethbridge, Alberta. Wikivoyage has a travel guide for Lethbridge.